What Line Will the House-Senate Budget Conference Draw? The new House-Senate Budget Conference chaired by Paul Ryan and Patty Murray is supposed to reconcile the House and Senate budget resolutions passed earlier this year make a set of new recommendations. The House and Senate will then vote on the conference agreement. While the conference should be an opportunity for Americans to engage in a more informed and open debate about policy, there is still much confusion, at least judging from the questions and emails I have been receiving. A starting point is to lay out in simple big picture terms what the House and Senate budget resolutions passed earlier this year look like. The chart below tries to do this. It was put together from those resolutions passed last March. It provides the year-by-year totals (not ten years sums) needed to compare the two budgets. This kind of chart is more useful for comparing budgets than the ten-year multi-trillion dollar totals which few people can understand. 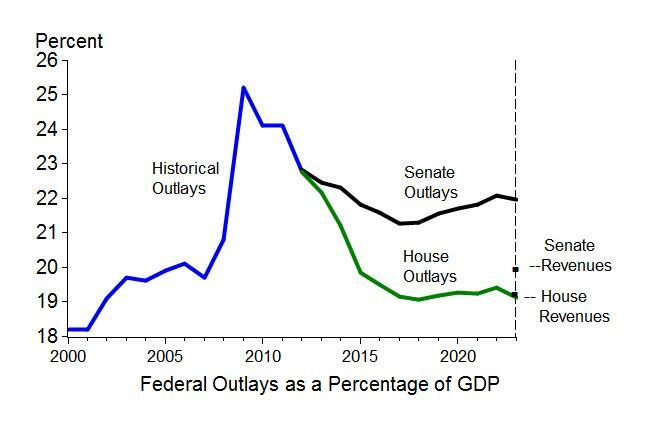 The chart shows the recent history of federal outlays along with the path of outlays as a percentage of GDP under the Senate proposal and under the House proposal. There is a big difference in these two paths. Spending gradually comes down to pre-crisis levels as a share of GDP under the House plan and remains high under the Senate plan. I have been arguing since 2009 that undoing the recent spending binge is a reasonable goal, and prefer the House version on that count. The Senate budget would also tax more than the House budget by .7% of GDP and run a deficit larger than the House budget by 2.1 percent of GDP, where the percentages are based on 2023. In my view the House proposal is superior on these two counts as well, especially given that taxes have already increased and the debt is continuing to explode. But the budget agreement will have to be a compromise of some kind and the question is where between the House and Senate lines will the conference draw the compromise line on the chart?